In an effort to give community members an opportunity to share their thoughts on Denver’s vision for growth over the next 20 years with Denver’s Planning Board, a stand-alone listening session with the board will be held Wednesday, February 27, from 4 – 7pm in the Webb Municipal Bldg, Room 4.G.2-4.F.6. (signs will be posted to help direct you to the room). The session will be broadcast live on Denver 8. 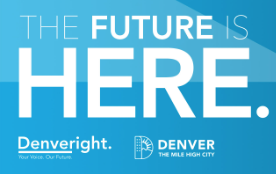 The session will be focused on the current drafts of Comprehensive Plan 2040 and Blueprint Denver, part of the Denveright family of plans that will help shape a more inclusive, connected and healthy city. City planners will use the comments to make final edits to the plan drafts. Complete information on the meeting is available on the Denveright website. If you have any questions, please feel free to contact Alexander Foster.